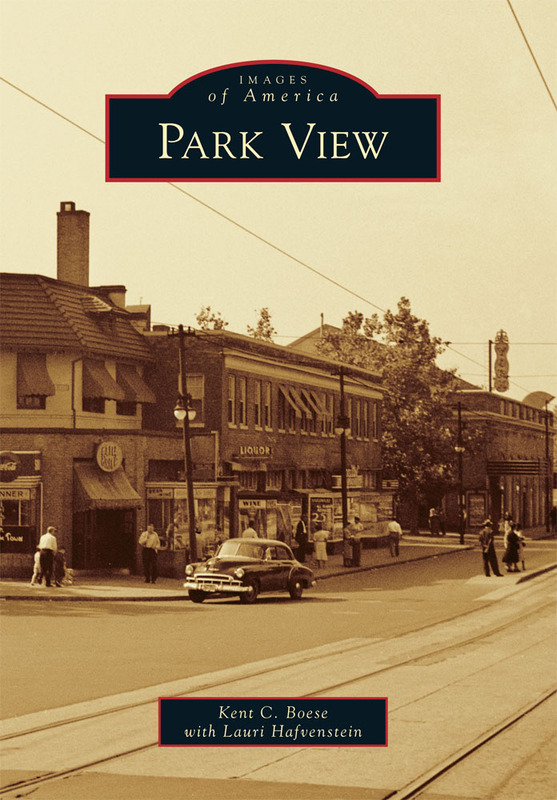 Bruce-Monroe @ Park View | Park View, D.C. The DC Public Schools, DC Dept. of General Services, Shinberg.Levinas Architects, and Winmar Construction will be at the Bruce-Monroe @ Park View school for a public meeting to share updates on the kitchen, cafeteria, and parking project. The meeting is scheduled for Tuesday October 3, 2017, at 6:30PM in the Bruce-Monroe @ Park View Auditorium. All are welcome to attend. At a School Improvement Team meeting held on November 2nd (minutes here), it was confirmed that $11.2M has been dedicated to replace and upgrade the cafeteria at the Bruce Monroe @ Park View Elementary School. The project was delayed in part due to a lot of turnover at the Department of General Services, both on the procurement and project management side. As a result, DGS has decided to execute in a more efficient way — Design-Build. This is when the architect and construction company are brought on together, which allows the design, planning, pricing, permitting, and construction to move quicker. 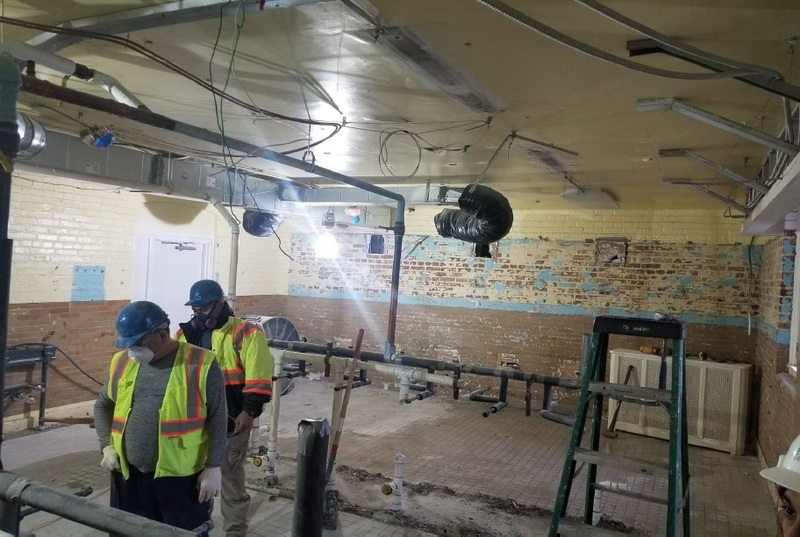 The cafeteria kitchen expansion project is expected to increase the dining area for students and cooking space for staff. At the time of this posting, the RFP had not been issued, but is expected to be issued any day. 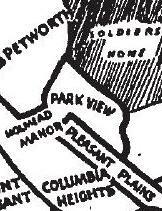 Interested neighbors can check the Bruce Monroe @ Park View School Modernization Web page for updates. Bruce-Monroe @ Park View Elementary, located on Warder Street. A core group of School Improvement Team members met at the Bruce-Monroe @ Park View school last night to begin discussing additional improvements to the school. Among those in attendance were teachers and school administrators, representatives from DCPS and DGS, Councilmember Nadeau, Commissioner Boese, and a few parents. The primary purpose of the meeting was to set expectations for future meetings and to begin the dialogue to determine what improvements should be made. The school currently has a budget of roughly $5.7 Million to put towards design and construction. There will also be a River Smart Grant available in 2017, though the amount is not yet known but probably won’t be for more than around one to two hundred thousand dollars. 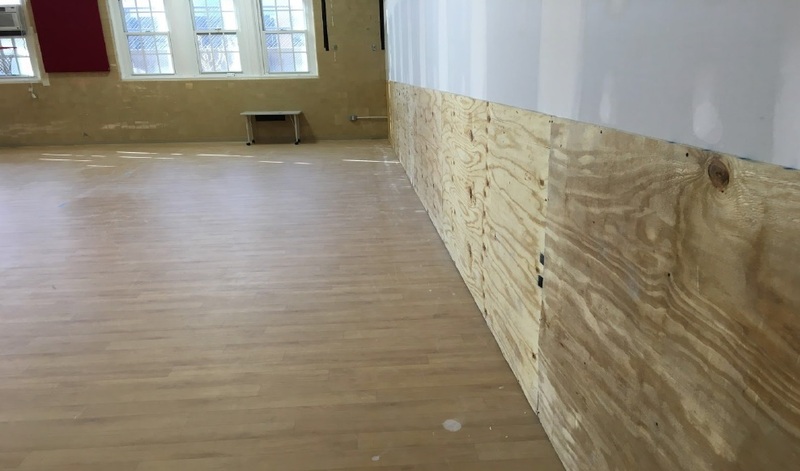 While a project high on the priority list for the school is a renovated cafeteria and parking lot, it was shared that the money needed for that project would be around $10 Million. 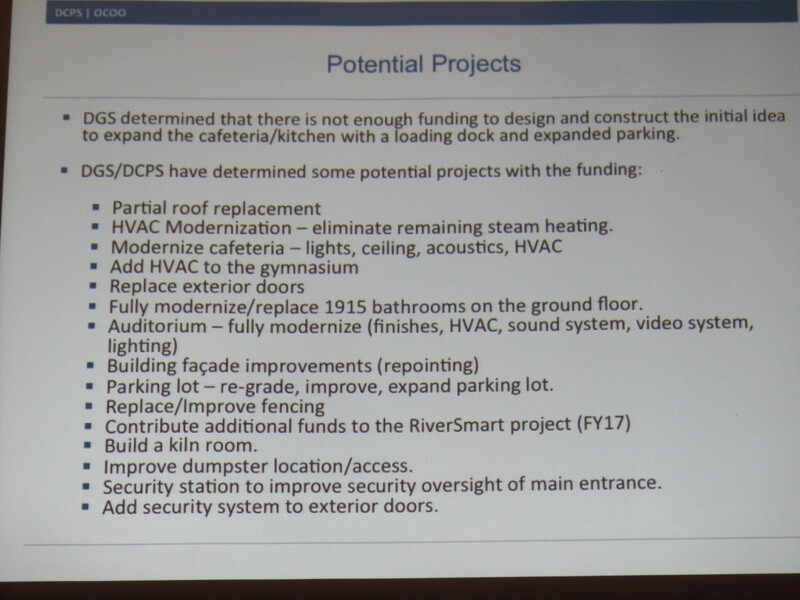 To begin the conversation, Patrick Davis of the DC Public Schools shared a list of potential projects with the group (below). As part of the discussion, it was noted that there is a strong desire to finish the modernization of the school, and that the cafeteria is a high priority. 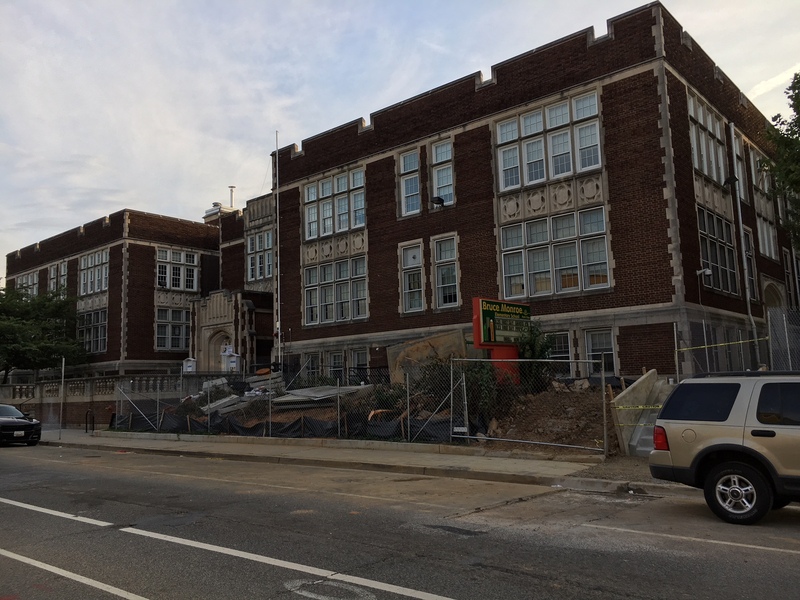 The homework given to DCPS prior to the next SIT meeting is to compile a complete list of projects required to consider the Park View School building as fully modernized, along with cost estimates for those projects. While the SIT currently needs to make a decision for the use of the $5.7M, it is also interested in knowing what funding is needed to finish the modernization. The first phase of modernizing the building was completed in Summer 2012. I wanted to share a new crowd-funding resource with the Park View community that allows parents, community members, and supporters of education everywhere to fund classrooms at Park View’s local elementary school, Bruce-Monroe Elementary at Park View. Teachers at BMPV cannot solicit donations directly from parents because of federal regulations meant to protect low-income families from being asked to pay added costs when attending school. But these teachers have many deserving ideas for projects, field-trips, and other resource-intensive activities. Often, teachers pay out-of-pocket to make these ideas possible. Now there is a new crowd-funding resource available to BMPV teachers: adoptaclassroom.org. The current projects for BMPV teachers are listed below. Please consider donating to a worthy local teacher as a way to support our neighborhood school. In visiting Bruce-Monroe @ Park View Elementary School last Friday, I was able to see the progress of the new elevator that is being installed. Judging from what I was able to observe and the conversation, the elevator could be finished in the next week or so. 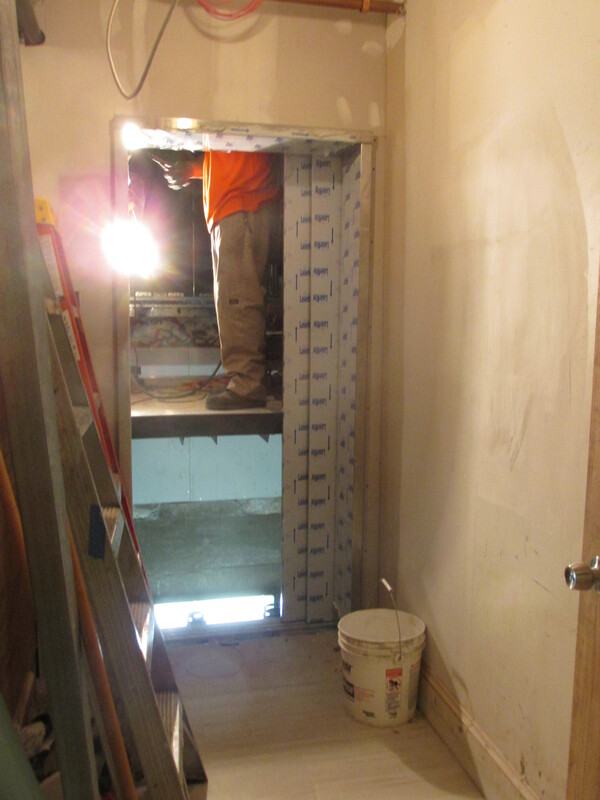 Then the elevator will need to pass its inspection before it can be officially placed in service. I also learned that the lifts that are planned to provide ADA access to the cafeteria and gymnasium are still in the planning process. I’ll be following up with DGS to learn more about when work will begin with them. It’s nice to see the elevator nearing completion. I began working on this in January 2014 after learning that the school had an immediate need to provide access for one of their students. The funding was identified from FY14 funds and therefore not represented in the FY 15 budget.